Outlook includes two methods to send messages at a later time: an after sending rule that holds a message in the Outbox for up to 120 minutes or a setting in Message Options to send the mail at a specific time. You can use VBA to send a message when a reminder fires. See Send an email when an Appointment reminder fires for the code. To delay messages sent during specific hours, see "Delay Delivery of Messages Sent at Specific Times"
To hold messages for up to 120 minutes, you need to create an "after sending" rule. This rule can apply to all messages or only to messages that meet the conditions you set. Open the Rules Wizard and click New rule. Choose Defer delivery by a number of minutes at the bottom of the Actions list. Click on the "a number of minutes" link to select the desired number of minutes to hold the messages. Click Next and set up any desired exceptions, then click Next again. Enter a name for your rule, turn the rule on and click Finish to finalize the rule. Using "Do Not Deliver Before"
Outlook can hold mail in the Outbox and send it at a later date. For this to work, you need to have Outlook running at the appointed time. If you use Exchange server and online mode, not cached mode, the message is moved to the outbox on the server, allowing you to close Outlook. The option for "Do Not Deliver Before" is on the Options dialog (shown above) or, in Outlook 2007 and newer, also on the Options tab. When I Delay Delivery of a message does it get sent from my PC to the server and wait there? Can I close Outlook, log off my PC and it will still get delivered even if I don't log on to my PC again until after the requested delivery date/time? When you use Delay Delivery, the message is held in the Outbox on your computer, waiting for the scheduled time, so you will need to leave your computer logged in and Outlook open to send it. There is one exception: when Exchange mailboxes are opened in online mode, the message is held on the server. Note that this is one Exchange feature not supported by Outlook.com, as it only uses cached mode. If you hold messages to send later, you will receive a prompt from Outlook every time you close Outlook, reminding you that there are messages waiting to be sent. You cannot disable this alert. It really does have purpose: Anyone who doesn't use Send Immediately or is having connectivity issues appreciates being told Outlook hasn't sent the messages in the Outbox. Use this dialog to stop accidentally closing Outlook. One of the utilities in the MAPILab Toolbox, Email Scheduler allows you to chedule messages to be sent at specific date/times or intervals by setting up a task for each message. MAPILab Toolbox is a set of 18 different add-ins for Outlook. Schedule Recurring Email schedules email to send later. The maximum number of emails that can be scheduled can be in the hundreds. You can schedule emails that go out hourly, daily, monthly, early, or randomly. The monthly and yearly patterns can be adjusted by a number of days so that schedules like "2nd to last workday of the year" or "3 days after the first Tuesday of every month" can be specified. Works with all Outlook accounts, including IMAP and Outlook.com. Use ScheduledSend for Outlook to send emails on a schedule. Set a schedule and recurrence as Outlook appointment and send emails on a later date. The add-in adds a separate calendar where all your scheduled emails are displayed in a familiar fashion. SendLater is a free Outlook add-in e-mail scheduler with recurring email option. Prepare all your email notifications and reminders in advance and schedule their delivery. Re-send email automatically if a reply is not received. Set up repetitive follow-up emails at comprehensive time intervals. When sending recurrent emails, you can set path to CSV file and load recipients from that CSV file automatically. The updated SendLater is fully compatible with the latest Windows 2018 October Update and Microsoft Outlook 2019. 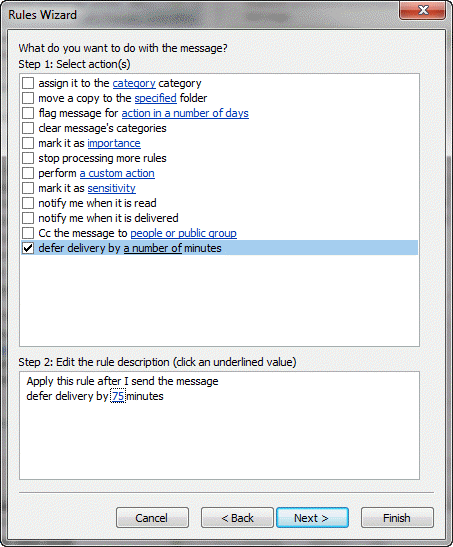 SetDeliveryTime has been created to allow users to set the default value for the "Do not deliver before:" parameter in Outlook. Mail Tools for Outlook - Outlook mail tools that don't fit in any of the above categories. Absolutely does not work. Attempted delayed transmission just sat in the Outbox, from which it was impossible to send. Message had to be placed in the Inbox before Word allowed "Send." The delayed messages sit in the outbox. How can you sort them by delivery date? Add the Defer Until field to the view - then sort by it. I am glad to see that you are still following this question chain. I am using Outlook 2010. I try to send delayed delivery emails, but then I logout when I am not using my computer, so the message does not send until I log back in. Is there a setting that still allows these messages to go through whether I am logged in or not? Thanks so much!! If you don't use exchange, you will need to leave outlook running. If yo use exchange and can connect in classic online mode, messages get handed off to exchange and outlook can be closed. How do I make this work? I had a email scheduled for the next day certain time. Than I just closed my laptop not thinking anything of it. Than I go to see if the test email came through and see nothing. How would I do this to make it right? You need to leave outlook open and the laptop on. If you don't use an exchange server account and online mode, you can't close outlook. I have a log in to outlook 365 for the web (as its business based email). Is that what you mean by exchange server? I am not understanding what you mean exchange server account and how it would work. Last night I called godaddy and they couldn't help me so I really appreciate your feedback and answering my question. I am wondering if one can schedule a "reply" or "reply all" for a later time/date? I know how to schedule an initial email to send later but can't figure it out with regards to a reply email. It would work the same way - you need to create the reply then set the option to defer it before clicking send. If I create a rule to delay sending a message for 5 minutes in Outlook 2013 with Exchange Server on premises, once I click "Send" the message is held in the Outbox as expected. If I go to the Outbox and I want to send the message without waiting for the 5 minutes, I've tried to open the message and uncheck the "Do not deliver before.....". I was thinking if I cleared this field and click "Send", the message would leave right away without waiting for the 5 minutes. This doesn't work. Is it supposed to work this way? I have question about outlook. I used option delay email and everything is working great BUT. I am sending message to my client at 11pm and setting don't send before 9am.He will receive this at 9am ,but it showing in the message that I sent this at 11pm.Is it possible that he will have showed that I sent this at 9am and he received at 9am even if I sent at 11pm? I just don't want to show my clients that I am working evening hours as they will be sending me million emails. I've set mine for 1 minute. This is so when I have that "uh oh" moment after hitting send, I have a bit of a buffer. The problem is this rule seems to cause Outlook to ignore manually deferred delivery, say one I've set for 3-4 hrs later for some reason. Any ideas how to get those to work too? It worked in Outlook 2010 with the Outlook Hotmail Connector, but the "Defer delivery by a number of minutes" rule in Outlook 2016 RTM with Outlook.com (Hotmail) using Exchange ActiveSync doesn't work. The rule gets ignored and e-mails are sent immediately. Using the "Do Not Deliver Before" manual option works fine. This is a problem with Outlook Rules as the "Defer delivery by a number of minutes" rule actually enables the "Do Not Deliver Before". It's the same functionality but done for you. Using the same "Defer delivery by a number of minutes" rule on an IMAP account in Outlook 2016 RTM works fine. I've not tested it in Outlook 2013 with Outlook.com (Hotmail) using Exchange ActiveSync. So cannot comment on that. I'll check it in Outlook 2013, but I'm expecting the same behavior. Outlook.com is moving to exchange servers and once it's moved, the problem will go away. Everything will just work.